Late September bought clear skies that, as is usual, coincided with a full moon. With the telescope now mounted on its pier, it is a matter of moments to roll the roof back and be observing. With a bright moon drowning out the faint fuzzies, it was time to enjoy our closest celestial neighbour. Even when the moon is near full, there is always something to see. 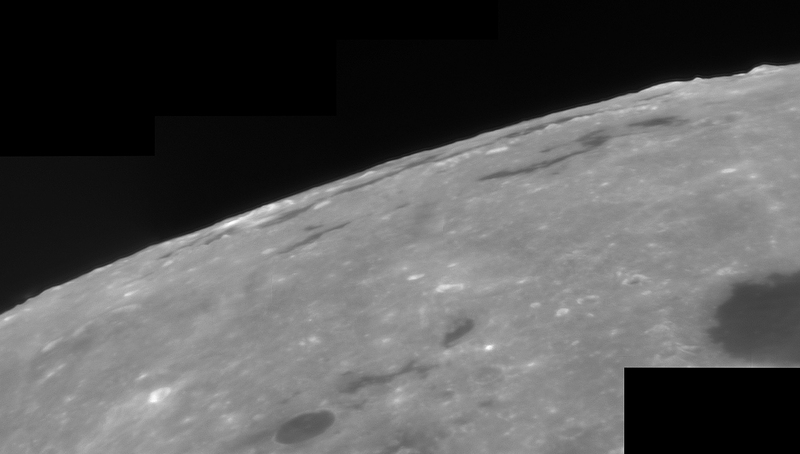 All images were taken with a C11, x2 barlow, ASI224MC and through a 685nm IR filter. A fascinating object we never get to really see is Mare Orientale of which this image is at the nearest part, a huge impact basin that remains hidden on the far side of the moon. Occasionally, we can peer round the limb and just catch these dramatic ramparts and lava plains. What a sight it would be if we could see it face on! The image shows the double ring of mountains – Montes Cordillera and Montes Rook which form the outer boundaries of the shock waves created during its formation. Interestingly, there was a huge debate about whether lunar craters were volcanic (ie formed from within) or impacts from minor bodies (formed from outside) that wasn’t truly settled until well into the 20th century. I wonder if this debate would have been settled far earlier if our predecessors could have clearly seen Mare Orientale?